Blank green CDR in jewelcase with black-and-white backing sleeve and black and white insert. This extremely rare CD Reference copy was made by Tape To Tape Audio Duplication. 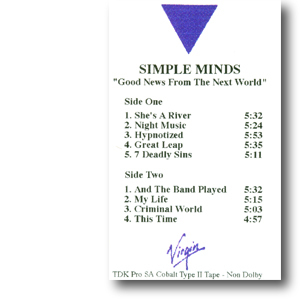 Based in London, the CD was made for Virgin in late January 1995. Many thanks to Rolf for the scan . Black cassette with a Virgin typed sleeve. The date on this test pressing cassette (20th September 1994) confirm that the album was completed by this date; but wasn't released until over four months later. This tape is extremely rare and hardly any copies surface now. Other copies exist with the date of the 23rd September 1994. Black cassette with white paper labels in a Virgin typed sleeve. 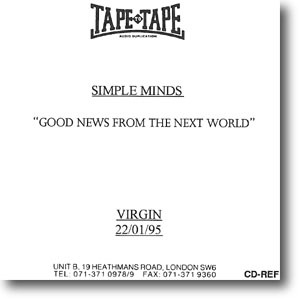 This tape was produced by Ezee Tape To Tape Inc in West Hollywood for Virgin America. It's not dated so it could've been made between September 1994 and February 1995.